Running Hunters Lodge is the perfect way to enjoy the company of so many interesting guests. We provide a welcoming and comfortable place to stay from where you can explore the genuinely exceptional area in which we live. 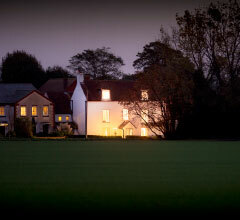 Hunters Lodge was originally built as a hunting lodge on the Goodwood Estate circa 1650. Over the centuries, it was modified and extended to become a private home, but in the early 1900s, its interior was refurbished to become the Hunters Inn. It became a treasured part of the local community, playing host to weddings and christenings, meetings and parties. It ceased to trade around year 2000 and restoration began in 2006. Today it stands as a lovingly restored, beautiful and comfortable Grade 2 listed home which has retained much of its original and distinctive character. Craftspeople experienced in sensitive and thoughtful interior restoration, have worked to ensure that the period features work in harmony with high-end, modern utilities to create an incredibly special, truly unique home to which we extend all of our guests a warm welcome. 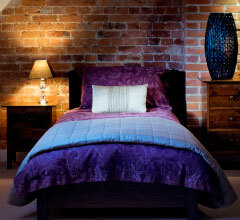 We offer three spacious, en-suite bedrooms. With magnificent views across South Downs National Park, each bedroom has its own individual character, charm and appeal. Our Aga-cooked breakfasts are enjoyed around the large dining room table and the comfortable sitting room invites guests to relax and unwind. To complement your stay we offer aromatherapy massage, holistic and make-up treatments on-site. These can be booked directly by guests through local therapists The Healing Factory – 07917 865918. We provide on-site car parking and we’re easy to reach by train, just a ten minute taxi ride from Chichester station, or by the number 60 bus. We can provide secure storage for bikes and also have two for hire. 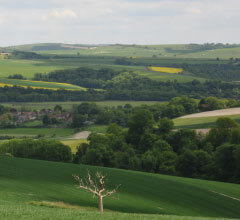 With prior arrangement, walkers can be collected from and dropped off at nearby points on the South Downs Way. feed the birds with the morning bacon rind!